Of course, that is the core of our historical, Christian Faith. Yet, think about this – what if that was all we knew? What questions would we have? What things could we deduce from such this historical record? Pause to consider that for a moment. He is probably who he claimed to be (but the debate is just who did he claim to be?). He will be coming back. We are to believe in him. We are to live according to his teachings. The earliest of the Jesus followers knew that much. Thankfully, God sent his Spirit just as Jesus promised. The Holy Spirit brought hearts alive, indwelled, empowered, and then spoke through those early disciples to explain the relevance of the complete story of Jesus (from pre-birth to his ascension). James wrote about how to think wisely and live well as a true follower of Christ. Two of the letters that Peter wrote were inspired and preserved for us, telling us about the beauty of such good news and its relevance for Christians in the day to day experiences. Then, we get to Luke’s writings. Luke recorded a short history about Jesus and then wrote how this Gospel impacted the early disciples and caused the initial explosive growth of the Church. It was due to the power of Christ’s resurrection, Christ’s word, and Christ’s Spirit. Paul, a master teacher, is converted and called by God to teach the disciples the implications and relevance of Jesus’ resurrection and ascension. He presents to us the explicit impact of Jesus’ death, burial, resurrection, and ascension upon those who trust and believe in Jesus the Christ. What does Jesus’ resurrection mean for you if you trust and believe in Christ? Turn to 1 Corinthians 15 and read through this very important passage. I Corinthians 15:1-11 – Jesus was raised from the dead and there was viable evidence as well as plenty of eyewitnesses to testify to the event and to see a risen Jesus after his crucifixion. 1 Corinthians 15:12-19 – If Jesus was not raised from the dead then we have no basis for our Christian faith. We are without life, without hope, and without truth. 1 Corinthians 15:20-28 – But Jesus was resurrected from the dead and that resurrection makes us alive, gives hope for a new resurrected body when our bodies die, and assures us the most brutal, unforgiving enemy we have, which is death, is itself destroyed. But wait! There’s much, much more. Paul, Peter, and John teach us the relevance that Jesus is risen and we are risen, indeed! This is what we, those who have a saving faith in Jesus Christ, can know with great assurance. We are made right with God the Father (Romans 5). Good Friday put our sins on Jesus Christ. Resurrection Sunday puts his righteousness on us! We are made right because of Jesus. We are given the status of righteousness (Romans 5:18-22). We are also made alive and given the ability to live rightly before God and a watching world. This is because after Jesus was raised and ascended, he sent his Spirit to apply his life and work in us (Romans 6). This means that in Christ, through his Spirit, he is in the process of removing sin from our souls in order for us to live rightly and to live well in the presence of God. We are made free from ultimate rot, decay, and destruction (1 Corinthians 15:42-44, 50-54; Peter 1:1-5). We will not experience death in the same way as those who are without Jesus (John 8:51; 11:25). We are now immortal like Christ (1 Corinthians 15:53; Philippians 3:21). Our souls and bodies are now adapted to God’s spiritual realm (1 Corinthians 15:44, 50-53). At the Great Resurrection, in the end of all history, we will receive the same type of body as Jesus’ resurrected body. Imagine having the ability to pass through walls (John 20:19)? Through Jesus’ resurrection, we are now empowered by the Holy Spirit (Colossians 1-3). Paul’s first prayer in Ephesians 1 is that God’s people would have the depth of understanding and be enlightened to fully know in our hearts and experiences the profound greatness of his power. That nuclear power, the same resurrection power that raised Jesus from three days of deadness and brought him all the way up into the heavenly presence of God to sit on that throne from which he rules all the universe; that power he gives to us so that we share in his kingdom and his rule (Ephesians 1:19-23). We have the power of solidarity in faith, which means we have union together in Christ (Eph. 2:11-4:6). We have the power to grow in Christ through faith. This means we have the ability to become like Jesus (Eph. 4:7-16)! We have the power of light over darkness through faith. That means because he has risen from the dead, we can live like Jesus Christ (Eph. 4:17-32). Finally, we have the power to conquer by faith so that we can be and are now overcomers in Christ (Eph. 6:1-20)! We have the new image, the new likeness of the One from heaven (1 Corinthians 15:48-49). Not even Adam or Eve had this when they were made in the image of God. We will never die again. We are risen, indeed (Romans 6:8-9). We each have our own “tent” made to endure eternity (2 Corinthians 5:1). He destroys all the old rule, power, and world to deliver his new kingdom to God (1 Cor. 15:24ff). He makes the old and dying body into something new and living (1 Cor. 15:50-54). He gives us new life (1 Cor. 15:20-22; Rom. 6:4). He refashions us into a new image of God (Eph. 2:8-10; Eph. 4:24; Col. 3:10). And, he will bring us to the new heavens and a new earth (Isaiah 65:17; 2 Peter 3:13). Easter Sunday is Resurrection Sunday. In fact, every Sunday commemorates Jesus Christ’s life, death, burial, resurrection, and ascension. Jesus rose from the dead? Yes! Does that event mean anything to us? Yes, if we trust and believe in Jesus Christ as our savior and lord. Our rejoicing on Easter Day is not merely a celebration that Jesus died and came back from the dead. So did Lazarus and many others. Our rejoicing is over the fact of Jesus’ bodily resurrection and that it has significant, applied relevance for our lives as Christians! Jesus is risen! 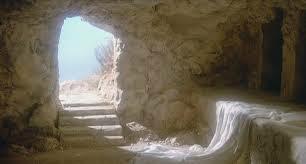 And we are risen, indeed! Older PostDid You Know There Are Different Hebrew Words for "Law"?